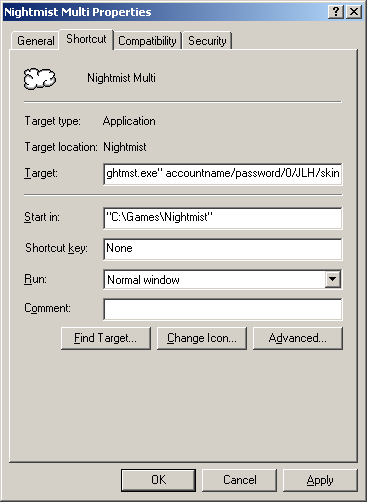 Setting Up NightMist to "Auto-Login"
First thing you must find is the short cut you use to log into NightMist, right click on the short cut and highlight the properties button. When you click on the properties button it will come up with a box like the one above. After the box is open you must change the target to set up your Auto-Login. As you see above after the - C:\Program Files\Nightmist\nightmst.exe - or whatever yours might say you have to put the following info after the nightmist.exe. After you are done making the changes click OK to save the changes. From now on when you click on the short cut to NightMist it will automatically log you into your account and the character (if you chose one)!